In his contribution to LinkedIn’s #BigIdeas2016 series, Deepak Chopra, world renowned author and speaker, shared his view on the increased importance of well-being transparency and assessment as we move further into an age where health can be quantified and bolstered by technology. For some, well-being may be an ambiguous concept that holds little importance to the material world. However, through research conducted by Gallup and Healthways, well-being is no longer a misunderstood idea nor an intangible notion - it can be definitively measured and interpreted. Since 2008, Gallup and Healthways have partnered to understand the well-being of both individuals and populations. Together, we measure and study well-being so we can act efficiently and effectively to improve it. We have made it easier for business leaders and government officials to make informed decisions by helping them understand and quantify well-being through two key initiatives. The first, a scientific survey instrument and reporting experience called the Gallup-Healthways Well-Being 5™, is used to give each participant a “single number that informs you of your total state of wellbeing,” as Dr. Chopra says of the ideal quantification, “evaluating not just the body's vital signs but the mind-body connection as well.” It measures the five interrelated elements that research has shown to have the greatest impact on an individual’s well-being: purpose, social, financial, community and physical. Insights gained through this assessment help individuals take the first steps on their journey to living better. Our second initiative, the Gallup-Healthways Well-Being Index®, takes the concept of quantifying well-being at an individual level and expands it to include communities, states and nations. The Gallup-Healthways Global Well-Being Index uses self-reported data from individuals across the planet to create a unique view of global states of mind and societies’ progress on the elements that matter most to well-being. Globally, higher well-being has been associated with outcomes indicative of stability and resilience — for example, healthcare utilization, intent to migrate, trust in elections and local institutions, lowered daily stress, food/shelter security, volunteerism, and willingness to help others. Understanding these relationships allows world leaders insight into their populations that might not be otherwise transparent. A new report from the Gallup-Healthways Well-Being Index® ranks the 100 largest communities in the United States by their comparative well-being. North-Port-Sarasota-Bradenton, Florida, has the nation’s highest well-being, followed by Urban Honolulu, Hawaii; Raleigh, North Carolina; Oxnard-Thousand Oaks-Ventura, California; and El Paso, Texas. El Paso also leads the nation in purpose and physical well-being. Youngstown-Warren-Boardman, Ohio- Pennsylvania, has the lowest overall well-being in the country, as well as the lowest purpose and social well-being. The four communities rounding out the bottom five in terms of overall well-being are Toledo, Ohio; Knoxville, Tennessee; Dayton, Ohio; and Indianapolis-Carmel-Anderson, Indiana. The state of Ohio has five communities among the ten ranked for lowest overall well-being. “State of American Well-Being: 2014 Community Well-Being Rankings” examines the comparative well-being of the largest 100 communities in the United States. You can read more about the rankings here and download all the reports here. To discover where other communities — including yours — fall within the rankings, download a copy of the report today. You can also subscribe to content from the Well-Being Index; by subscribing, we’ll let you know when we release new reports and insights from the Well-Being Index. At the 15th Population Health Colloquium in March in Philadelphia, PA, innovators across the health care industry gathered to discuss building a culture of health and examine real world examples of population based care being implemented by leading companies and organizations. Participants discussed the value of having a scientifically validated measurement of well-being in order to enable public- and private-sector leaders to know where they stand and how best to develop and prioritize strategies that help their populations live their best lives. All attendees received a copy of the ‘‘Best of Population Health Management’’ supplement, which compiled the most requested articles of 2014. The introduction to that supplement was authored by Ben R. Leedle Jr., President and CEO of Healthways, and appears in its entirety below. It is reprinted with permission of Population Health Management. The United States is facing an unprecedented health crisis. Rising costs, declining quality of life, lost productivity, stress, care provider shortages and an aging population continue to place a heavy burden on the American economy, on the vitality of our communities, on the viability of our enterprises and on individuals in need of both health improvement and services to optimize their care. How do we effectively, sustainably reverse these trends? Our industry has been grappling with this question for some time now, a question that propels us to bring our research to increasingly more rigorous levels, to collect richer data from myriad perspectives, to continuously refine metrics of value and to innovate at a faster pace than ever before. Where we collaborate on these endeavors, the best results ensue. 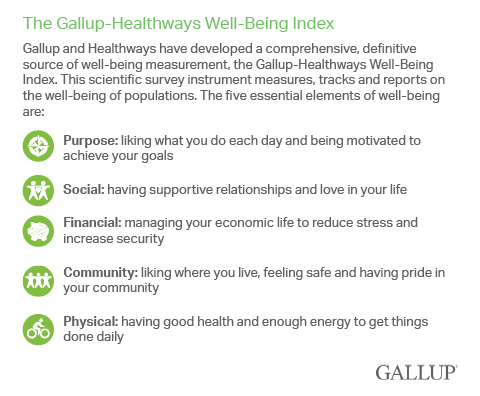 On January 2, 2008, Healthways began a journey with Gallup to define and measure well-being. Our goal was to understand what is fundamentally important to people, how we experience our day-to-day lives, how we make thousands of decisions every day, and what we think our lives will be like in the future. This information would help us look beyond just physical health and more fully explore its multifaceted nature, including what causes our behaviors and habits to move in positive or negative directions. The concept of health encompassing more than overt physical symptoms or disease was nothing new, but organizations like ours that deliver population health interventions largely had physical health data — primarily retrospective effect data — to direct our efforts. Without a deeper understanding of what distinguishes a thriving life from one spent suffering, we realized, those interventions would fall short of our three aims: to keep healthy people healthy, to reduce or eliminate lifestyle risks, and to optimize care for those with known conditions or chronic disease. In other words, we needed to uncover and address other aspects of life that either reinforce or work against our best intentions — we needed real-time root cause data. Decades of clinical and behavioral economics research as well as experience delivering interventions aimed at positively changing behaviors formed the foundation of what eventually became the Gallup-Healthways Well-Being Index®, an in-depth, real-time view of how individuals, organizations, communities, states and countries perceive their well-being. Why are perceptions valuable? Measures such as unemployment, GDP and health statistics are essential, but they do little to help us understand why people change or do not change. Without that information, determining how best to support the improvement of their health and well-being is impossible. Since 2008, we have fielded millions of well-being surveys around the world. This accumulated data has enabled research indicating us that improving well-being is the best — indeed, the only way — to positively influence populations, and to sustain positive change. When we have a strong sense of purpose, supportive relationships, financial confidence, and strong connections to our community in addition to good physical health, we truly thrive. Scientifically proven and published in the pages of Population Health Management as well as other peer-reviewed journals, this fact is also basic common sense. Having a scientifically validated measurement of well-being enables public- and private-sector leaders to know where they stand and how best to develop and prioritize strategies that help their populations live their best lives. As David B. Nash, MD, MBA, Dean of the Jefferson School of Population Health, noted recently, “Researchers, policy makers and healthcare leaders need good information about the well-being of populations that they serve. Well-being sheds light on the issues that drive quality, cost and productivity. A well-being metric also supports the creation of an action plan for our nation, in order to achieve sustained improvement in the health of our citizens.” Well-being measurement affords diagnostic, design, process and value outcome specificity and clarity. Perhaps most importantly in terms of creating the change we all want, such measurement ensures the accountability of leadership. Population health is important work for us all. In fact, our recent analysis of global well-being revealed that only 17% of the world’s population is thriving in 3 elements of well-being or more. This tells us much work remains to be done to improve well-being and population health around the globe. Insights and best practice for improving well-being are universal — applying to all humans — and transcend the traditional boundaries for understanding health that are often ascribed to a population’s education, demographics, location and economy. Encouragingly, population health is getting the recognition it deserves as a strategic competence for healthcare and other organizations. As just one example, businesses are now hiring chief population officers. The need for the expertise, evidence and next-generation of leadership underscores the importance of the work being performed at the Jefferson School of Population Health. Another example of dynamic growth in the field is the new partnership formed between the Jefferson School of Population Health and the Population Health Alliance. The relationship blends the best of each group and assures the development and execution of innovative solution in our field. Healthways is proud to support these organizations and sponsor this inaugural “Best of Population Health Management” supplement, which compiles the most requested articles of 2014. Clearly, the rising incidence of chronic disease both in the United States and throughout the world shows that we are ready for a new approach, and these articles highlight some of the exciting advancement in our collective study. Together, we are learning from those on the front lines of population health practice and discovery, collaborating with greater transparency than ever before, and establishing the best practices in total population health that will truly transform health and care. As defined by Gallup and Healthways, the five elements of well-being are: 1) purpose (liking what you do each day and being motivated to achieve your goals), 2) social (having supportive relationships and love in your life), 3) financial (managing your economic life to reduce stress and increase security), 4) community (liking where you live, feeling safe and having pride in your community), and 5) physical (having good health and enough energy to get things done daily).